It’s parent/teacher conference time here in Minnesota. Which, as a parent of a child who just started preschool, was more nerve-wracking than I thought it’d be. Luckily, I’ve got a good child. Sure, he needs some help holding a scissors and his drawings of his family look like a bunch of Mr. Potatoheads on a good day, but he can also almost spell his name, knows all of his uppercase letters and can count to 14. Heck, I can’t count to 14 some days. Parent/teacher conferences are a great way for teachers and parents to discuss students. Parents can learn what they need to do to teacher their children at home, and teachers can keep parents informed of their child’s progress and ways to improve their performance. In a lot of ways, it’s like an employee review. Employee reviews are an important part of operating a green industry business. Reviews give you an opportunity to assess your team. You can identify ways to improve your employees', it performance. But they also help your employees. Surveys consistently show that employees want feedback on their performance. Employers that don’t regularly deliver feedback risk alienating and losing their employees. Bring along some quantitative analysis. We recently wrote a post on how to measure the revenue per hour of your irrigation technicians. Find numbers that matter to your business and assess how your employee is performing. Get feedback from co-workers and customers. Our service business marketing add-on, HindSite Connect Pro, includes customer satisfaction surveys that ask customers to rate your work. Take advantage of that customer feedback. If you’re reviewing an irrigation technician, get feedback from the office manager. Does the tech take good notes? Is he punctual? Does he communicate well with your office staff? Skills are important, but being able to work well with others is just as important. Create a performance improvement plan. Identify what your employee can do to improve and create a plan. Every review should include some type of improvement plan. We’re followers of the Entrepreneurial Operating System (EOS) as outlined in Gino Wickman’s book, Traction. One of the core tenets of EOS is that your business becomes goal-oriented by setting 10-year, 3-year, annual and quarterly goals. The system also preaches that every employee should have a number. That type of goal-oriented approach means employees always know what they should be doing and how they’re being measured. But setting goals also gives you a chance to measure your employees at annual reviews. If they didn’t meet their goals, delve into why. What obstacles can you remove? What issues are they having? Employees don’t always have to meet goals to be successful, but they serve as good talking points. Positive and Negative Feedback Shouldn’t Be Reserved for Reviews. We had a great conversation recently about whether we should even perform employees review. The consensus among those that were advocating against reviews is that they’re pointless if you’re a good manager. Every day should be spent giving feedback to employees. Which is true. Realistically, nothing you say in a review should be news to the employee. If you’re a good manager, they’ll know when they’ve done well and when they’ve underperformed because you’re communicating with them on a daily basis. So never save your comments for a performance review. I watch too much football. One of my pet peeves is when an announcer says a player does something well, but the broadcast doesn’t back it up with an example. If you say Ted Ginn has great hands, show me an example. Because I can show you 10 balls he dropped that he should have caught. Always give your employees examples when you give them positive and negative feedback. If one of your lawn maintenance crew members is consistently late, give him examples of dates and times when he was late. (Hint: Lawn maintenance software can help you easily track this information.) If your irrigation technician isn’t noting what parts were used, point to specific instances where parts were missing. Bringing examples makes any negative feedback feel less like a personal attack and more like suggestions regarding how to improve. Many people assume a manager should do most of the talking during a performance review. That is far from the case. A performance review should be a conversation with back and forth between the manager and employee. Remember, the goal of the performance review is to improve the employee. To do that you need to get the employee’s input. We discussed earlier the importance of setting goals. Ask your employee what they want to accomplish. Ask them to assess their own performance - where do they think they’re strong? Where do they think they’re weak? Get your employee talking about their issues, goals, aspirations, and ways they can improve and you’ll have a much more productive review. 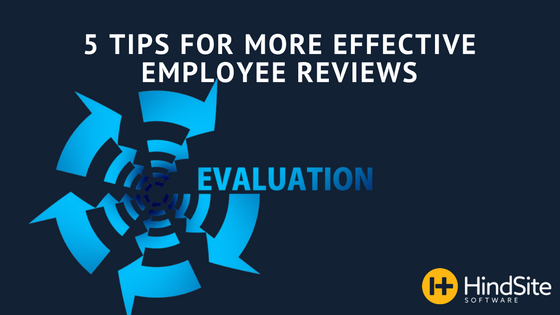 Got an employee review tip of your own? Drop it in the comments!